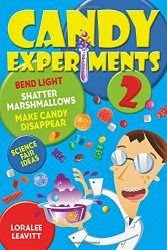 Candy Experiments: Fruit Fly Candy? They say that "You catch more flies with honey than with vinegar." Given the hoards of fruit flies that have been swarming our kitchen, I started to wonder: is this really true? Since this is a candy experiment blog, I thought I'd try it with candy too. Fruit flies are not attracted by Airheads, Starbursts, or Laffy Taffy, even when dissolved to enable fruit fly consumption. I could extrapolate from this that since fruit flies avoid candy, humans should avoid it too. And I would make exactly that point, except I'd be a hypocrite: if I were choosing between honey and vinegar, I'd totally choose the honey. *But only for fruit flies. When applied to the use of kindness when dealing with humans, it's still true.